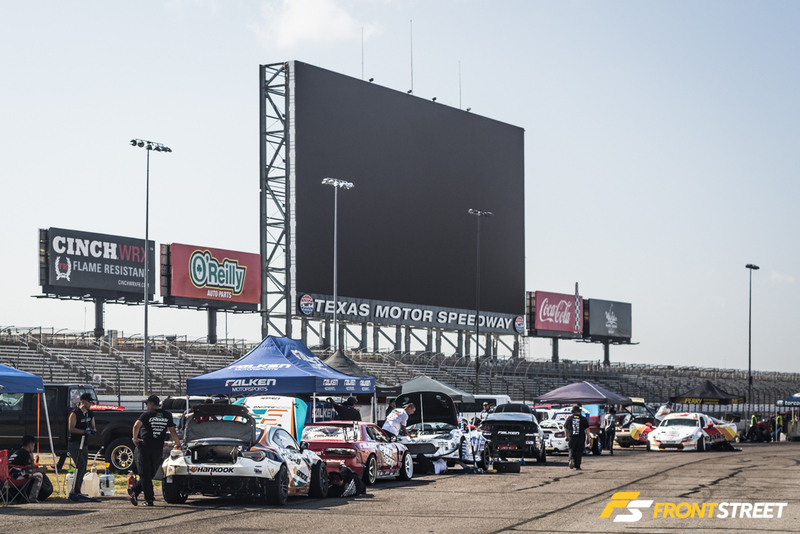 Though at times it was dramatic, there’s no questioning how action-packed Formula Drift was this past weekend at the Texas Motor Speedway. Throughout most of the Top 16, there were several ‘One More Time’ battles, and one driver in particular doing a tremendous amount of drift battling over the day was Scion Racing driver, Ken Gushi in the GReddy Racing FR-S.
Against Ryan Tuerck, Gushi went up to the maximum of two OMTs, and a single OMT against Kenny Moen, then another two OMTs against Daigo Saito before finding himself in the finals, where he came in just shy behind Masashi Yokoi. Gushi’s Second place finish pushed him into Second place overall in the Formula Drift Championship points standings, just behind Fredric Aasbo. Fredric Aasbo extended his lead in the 2015 Formula Drift Championship this weekend in Texas putting him in a strong points position heading into the season finale. Aasbo has won three of six rounds so far this year and leads the standings by 80 points over fellow Scion Racing and Hankook Tire driver Ken Gushi. Format VideoPosted in Videos | Tagged Ford, Ford Racing, Nitto Tire, Vaughn Gittin Jr. Thanks to our incredibly well-connected world, even if you have just a passing interest in the sport of drifting, you probably know that Speedhunters driver Vaughn Gittin Jr. had a serious crash at last weekend’s Texas round of Formula D. It was a brutal hit; the sort of car-meets-wall moment that makes you stop and say, ‘sh*t, I hope he’s going to walk away from this one.’ He did, thankfully. We needed to know the whats, the whys and the hows, so after giving just enough time for the dust to settle, we sat down with Vaughn (virtually) and talked about the incident, the aftermath and what happens next. Posted in Behind The Scenes | Tagged Ford, Ford Racing, Monster Energy Drink, Nitto Tire, Round 6, Texas Motor Speedway, Vaughn Gittin Jr.